Genesis heat set Artist Oils on 15cm x 20.5cm loose canvas sheet. Actual painting size is 13cm x 18.7cm. This painting is UNFRAMED and available for sale here. This painting is from a still life I set up in my studio. It features a lovely old jug that I found at an op shop. 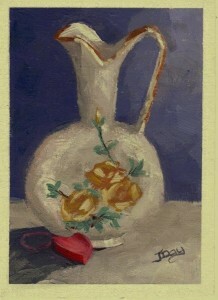 I added a small red wooden heart to complement the jug in this composition. Posted on May 21, 2018 by Jaana Day. This entry was posted in Still life and tagged Art, brush strokes, canvas, colourful, flowers, Genesis Artist Colours Heatset Artist oils, green, heart, oil painting, old jug, Painting, purple, red, Still Life, yellow. Bookmark the permalink.